You can add more than just dorm wall art of your favorite musician to showcase your love of music! Sure college posters of your favorite bands and singers are dorm essentials that will make your college dorm room feel a lot more home-like, but you can add more than just that. If you play guitar, you may want something a little more extraordinary and unique to display your interest in music. Look no further than our Electric Guitar College Poster! This dorm room decorations item will add super cool looking dorm room decor to your college dorm room and will really show off your interests. Our Electric Guitar Dorm Room Poster features an outline of an Electric Guitar on a white backdrop. The design of this dorm necessities item is simple, but looks pretty awesome. The outline of the guitar is filled with swirled red, black, tan, and white designs for college supplies that really pop. 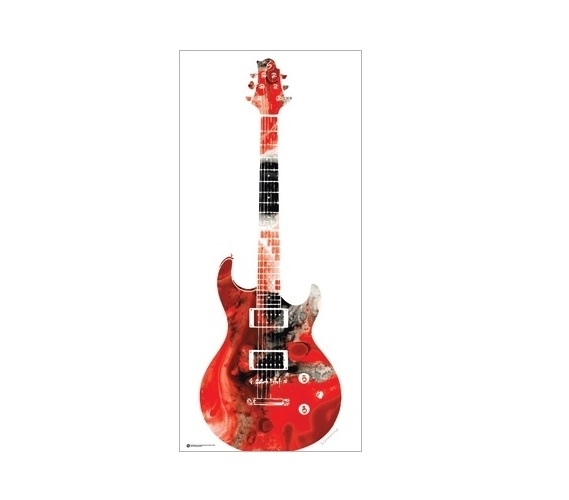 Whether you want to add college posters of your favorite musicians along with this dorm poster or you want a simplistic look with just this dorm essentials item, your wall decorations for dorms are going to be quite eye catching. You don't have to settle for looking at a bland dorm wall when you're not feeling inspired. Get some inspiration with our Electric Guitar Poster for Dorms in your Dorm Wall Art!